W Lim. 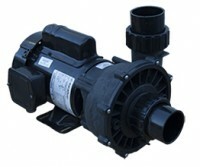 Corporation replaced the original Wave Pumps with the new 2016 incredible Wave I Series Pumps. The new Wave I Series Pumps come with the long lasting Industrial Marathon Motor custom built for W. Lim Corp. So when you hear the name, Wave I Series Pumps, you'll know that you're going to get a long-lasting, dependable pump. And with this being an external pump, it helps protect both you and your fish from annoying and potentially dangerous oil or electrical leaks.